If you want to convert more prospects into leads, more leads into customers and more customers into clients, you will fail if you send the same messages to different types of people. Instead, you need to find ways to acknowledge the unique relationship which each person has with you throughout the customer lifecycle. And at each of these stages, you, as a business owner, need to focus on a different key concept. To go from awareness to consideration, you need to be credible. To go from consideration to intention, you need to add value so that the person on the other end of your marketing campaign views your product as something he’d actually want or need. To go from superiority to conversion, you need to convince your lead that you are a superior solution to your competitors. To complete the conversion stage of the cycle, you need to focus on customizing your product to that person. Finally, for someone to move to the retention stage, that person needs to feel like he is receiving superior treatment to non-customers, so that he feels like he’s getting ongoing, consistent value. Let’s explore each stage in further detail. At the awareness stage, it’s all about credibility. Associating yourself with other trusted brands and credible sources will increase your own trustworthiness. If you’ve received awards or have interviewed credible professionals in your field, you can use that to help build the case for buying your product. If, for example, you’re trying to sell a product that promotes weight loss and have a number of prominent, respected nutritionists endorsing your product, that helps build credibility. Even your own podcasts and presentations at conferences can lead others to trust you. There’s a lot you can do behind the scenes that can help you portray yourself as an authority within your industry. Quizzes. From each quiz, generate customer-specific emails or results based on quiz inputs. Free reports. Share valuable information with your prospects. Guest blog posts. Leverage the credibility of another trusted blog. Infographics. Sometimes it’s all about presentation, and information that’s presented in a well-designed fashion can enhance your credibility. Keep in mind that images tend to make posts go viral, and can also make them more credible. Also, revealing a consistent personality makes you stand out from other. At this stage, it’s all about utility. When working on your marketing content, you need to ask: What are the specific problems we’re going to solve for each customer? ROI calculators. It can be very powerful to show how your solutions provides a return on investment. Banks have done this well by showing the ROI of a loan. This stage is a pivotal one because it’s all about converting your leads into actual customers. To complete that transformation, you need to focus not just on personalizing your product, but also on personalizing the marketing around your product. Keep in mind that most products are designed to solve a particular problem. If you can give someone more clarity about their problem than they’ve ever had before, you’ll automatically become the solution. This is because people will naturally feel that if you understand the problem better than anyone else, you must have designed a solution better than anyone else. Now that you’ve gone to all the effort of acquiring a customer, you want to ensure you keep as many customers as possible. 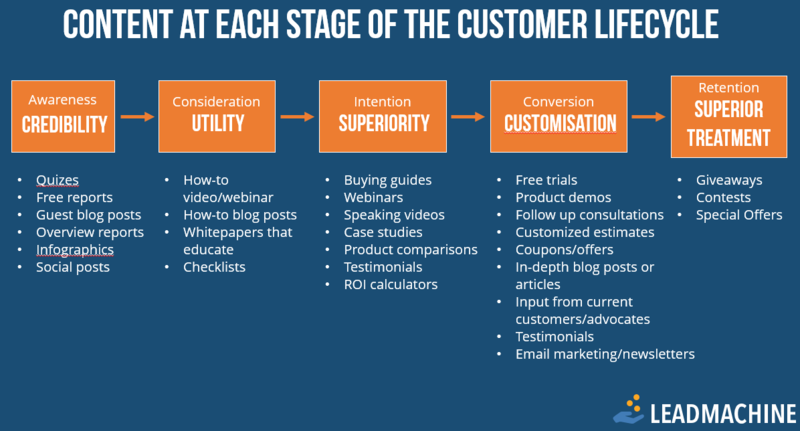 When you talk about a lead-to-customer lifecycle, don’t forget that each stage needs to build on the one before, and as you achieve your goal in each, you’ll be better suited to tackle the next. For example, once you establish your credibility, you’ll have an easier time building your case for your product’s value, or utility. And if you make content quality a priority, you’ll start to see more customers at the end stage of the cycle, right where you want them to be. Our friend Taki Moore has said that you want your marketing to be valuable like content, and you want your content to be persuasive like marketing. The most valuable marketing is great content, and the content that’s the most persuasive will serve as effective marketing.